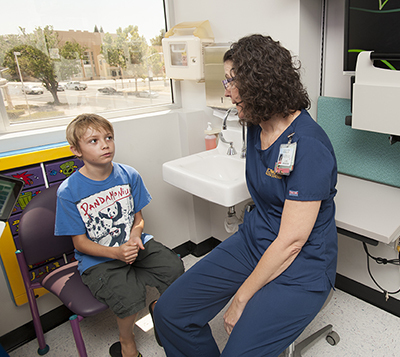 UC Davis Children's Hospital provides a wide variety of pediatric endocrinology services. Endocrinology is the study of the endocrine system, including the endocrine and thyroid glands and the hormones produced by each of them. The endocrine glands encompass gonads (in males the gonads are the testes, and in females they're the ovaries), while the thyroid gland produces thyroid hormones that are involved in such important cell functions body and brain growth. Hormones are chemical messengers that regulate body functions by transmitting signals or information from one cell to another. Children's glands and the hormones they produce help maintain growth and development, energy level, mood, and development of puberty. When there are too many or too few hormones circulating throughout the body, it can affect how your child feels and ultimately can cause disease. Pediatric endocrinologists, including staff physicians at the UC Davis Children's Hospital, are doctors who specializes in the diagnosis and treatment of children with diseases of the endocrine system, including growth disorders and diabetes, which involves the hormone insulin. UC Davis Children's Hospital's pediatric endocrinology services are staffed by a group of eminent endocrinologists, led by Professor Dennis M. Styne, the Yocha Dehe Endowed Chair in Pediatric Endocrinology and director of the Newborn Screening Program. Styne is an expert on pediatric endocrine disorders, growth and disorders of puberty, diabetes mellitus in childhood, thyroid disease and childhood obesity. He has played an integral part in establishing a new childhood and adolescent weight management program at UC Davis Children's Hospital. Using activity, education, and pharmaceutical therapy, he studies children in his Fit-Kid Weight Management Clinic, evaluating the best methods of assessment and treatment of obesity. He also has an outreach program to families in various Northern California Indian rancherias that promotes communication with the UC Davis-based children's weight management team. His research focuses on improving therapies for disorders of pubertal development and growth, the effect on traumatic brain injury on pituitary function, and the effects of endocrine disruptors. Professor Nicole Glaser's research emphasis is on pediatric diabetic ketoacidosis (DKA), an acute, life-threatening complication of diabetes, and brain injury related to DKA in children. In addition, she has interests in all aspects of type 1 diabetes care in children. Lindsey Loomba-Albrecht is an assistant clinical professor. A frequent co-investigator with Styne, she has joined him in co-authoring papers on such topics as the physiology of puberty, hyperthyroidism in children, neonatal diabetes mellitus, and the effect of puberty on body composition.